For the April Graphic Arts Special Interest Group meeting, we had the pleasurable honor of having Frank Midgley, creator of MacOSaiX, as our guest speaker. 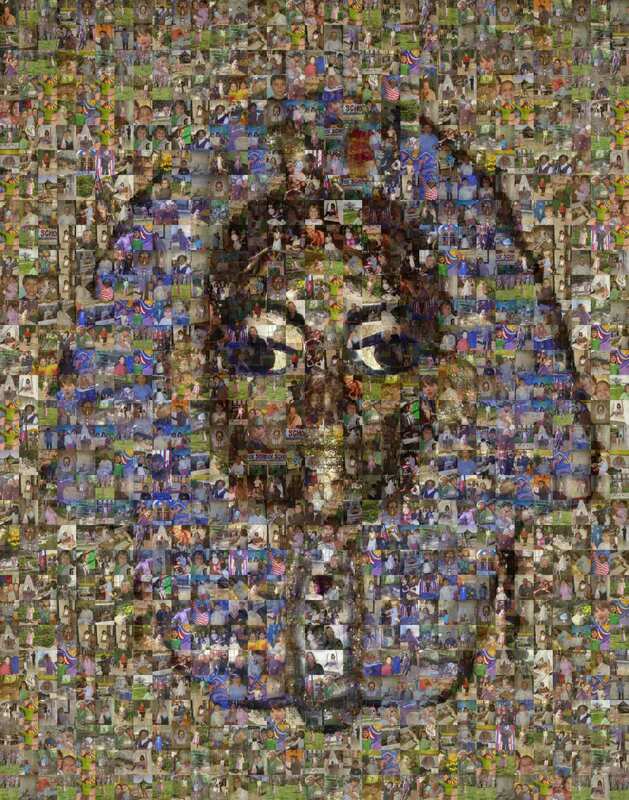 A portrait of King Tut formed from a mosaic of photographs taken by a second grade class. Hal Cauthen created the mosaic using Frank Midgley’s MacOSaiX. Click on the image for a much larger view. I introduced Frank with an anecdote about how I'd gotten interested in using his application. At my daughter's urging, I used the application to create a set of four large photo mosaics for my granddaughter's second grade class. The mosaics were made from photos the children (and their mothers) had taken of them at school. These pictures were then framed by my daughter, and displayed -- along with numerous pieces of art -- and then auctioned off in a fund-raiser for the elementary school. To my amazement the four mosaics were auctioned off for a total $2300, quite a tidy sum for the school's “Arts and Language” program. 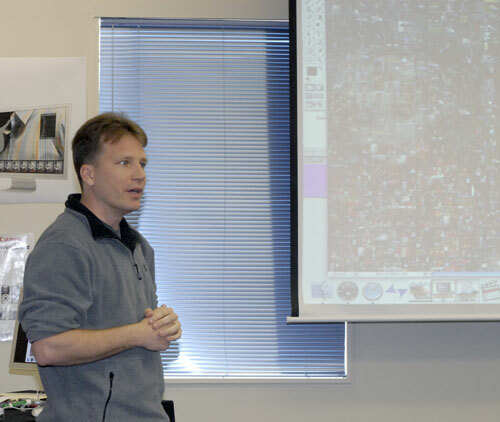 Frank Midgley talks about his unusual software application, MacOSaiX, as it works away on screen. Photo by Richard Sanderson, taken with a Nikon D-200 digital camera. Thanking Frank for creating MacOSaiX in the first place, and welcoming him to the GASIG, I turned the presentation over to him. He charmed the GASIG with a demonstration of his application. After first taking an image from the Web, he then set some simple parameters, and let the program search the Web for images that matched his criteria. As he talked, we watched -- fascinated -- as the program built the mosaic using tiles formed from images found on the Web, shown onscreen right before our eyes. 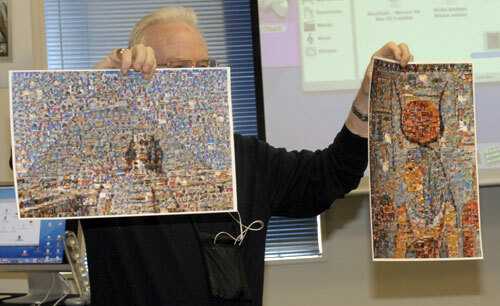 Hal Cauthen is hidden by two mosaics he created using MacOSaiX. Photo by Richard Sanderson, taken with a Nikon D-200 digital camera.